Toyota Yaris Pros and Cons | Page 1 of 3 | Why Not This Car? What drives people to buy (or not buy) a certain car? 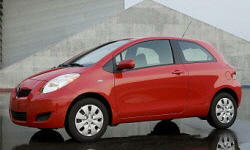 TrueDelta's members share Toyota Yaris pros and cons based on their real-world driving experiences. Your satisfaction with this car depends on your attitude and expectations. If you're willing to accept and mitigate a few quirks - and you realize that it's engineered for a price point - then you'll appreciate the very low cost of ownership and legendary Toyota reliability. I had bought a 2008 Yaris sedan 5 speed manual and sold it to my son. There was a good deal on a 2010 so I bought another one. Being 2000+ dollars more than the Focus was not practical. Its a Toyota, simple as that. They are built to last. By having the gauges in the centre of the dash it forces me to shift eyes more, therefore helping to keep me awake after long hours on the road. It also helps to break the monotony during driving. I commute 100 miles a day. It has a good reputation. I have known many Toyotas to have well over 250,000 miles on them without so much as minor maintenance and a few small repairs. Many years history of solid red dots on Consumer Reports Reliability Survey. My latest fuel economy was 45mpg. Enough said. It looked like it was grown on the ugly tree, fell off, and hit every branch on the way down. I needed an economical car for short trips. 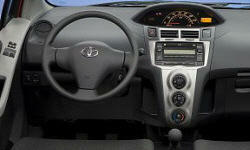 Fuel consumption is reported as being very good. My first trip showed good fuel economy. Ride position too low, visibility is not great. Dashboard HUD position is in the center of the dash and not directly in front of the driver. The base was cheaper, but with standard features, it was about the same price as the Honda Fit. First tank of fuel resulted in 35.44 mpg. Previous car was around 25 mpg.